Car manufacturing in the UK grew by 1.2% in January but commercial vehicle production slumped, the Society of Motor Manufacturers and Traders (SMMT) said today. A total of 129,049 cars rolled out of the factories in the first month of the year, and strong domestic demand meant that output of cars built for the UK market increased by 26.1% year-on-year. Mike Baunton, interim chief executive of the SMMT, said that despite ongoing economic challenges, growing demand for UK-built products in emerging global markets, combined with major new investment, indicates that 2013 will be a strong year for automotive manufacturing. According to the SMMT, independent analysts have suggested that UK car manufacturing could grow a third bigger by 2016, with output expanding to almost two million vehicles each year. The future looks rather less bright for commercial vehicle makers, however. Output in this sector, which includes a range of vehicles from light panel vans to heavy trucks, as well as buses, coaches and minibuses, fell by 20.5% to 7,822 units in January. A 3.2% rise in output for the domestic market did little to offset a reduction of 37.2% in the production of commercial vehicles for export. In a reversal of the situation in January 2011, more than half of the UK commercial vehicle output in January 2012 was for the home market. 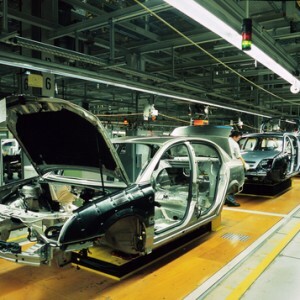 The SMMT expects further decreases in output over the course of 2013 as Ford scales backs its manufacturing. January also saw a decrease in UK engine production, which declined by 5.1% to 219,757 units. Manufacturers make some 2.5 million petrol and diesel engines in the UK each year, but last month exports declined by 9.5% year-on-year while production for the the home market was 2.8% higher than a year earlier.